NOMATIC Travel Bag is a sturdy and durable, functional and versatile, modern and contemporary, water resistant carry-on and gym pack in one with a 30-liter capacity. It is constructed with the robust waterproof materials, zippers and other great components inside and out. Nomatic Travel Bag is the ideal “go anywhere do anything” kind of bag with a very versatile design to suit different people’s different needs. You can change between backpack and duffel bag within seconds with its versatile strap system. There is a ventilation with a water-resistant flap just in the shoe section that lets you choose between protecting the shoes from the rain and water or let the fresh air in for ventilation. 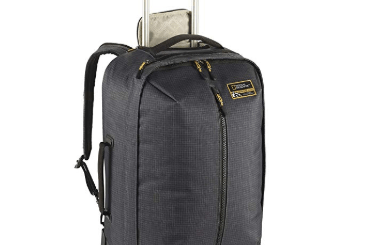 The 30 liter capacity Nomatic Travel Bag weighs 4.25 pounds and measures 19.4 x 14.5 x 9.4 inches. Just like with any product on the market it has its pros and cons and will be for some people, but not for others. The price is a bit high because of the very sturdy construction, good quality components used, great design, flexibility and a variety of features. And it would be great for those that like the contemporary bags with an ergonomic design. It wouldn’t really be for those that go camping and hiking and for a long time. 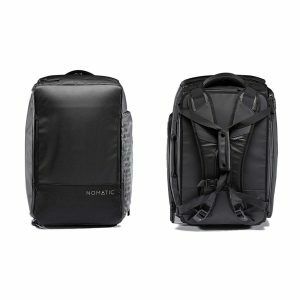 Nomatic 30L Travel Bag is quite a different design backpack than the traditional backpacks that many travelers or nomads use. With its 30-liter capacity it will be for those that like to travel light and for up to four days or so. And it is fine if you do not like to pack heaps of gear in your bag. It comes with more than 20 user-friendly and innovative features to make it the ideal one to own by different people for their travel or gym needs. So you have the great organization, efficiency, ergonomics, flexibility, versatility, functionality, minimalist design and modern unusual looks. 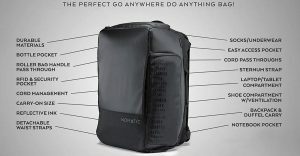 Nomatic is a well-known bag brand with a range of other great quality products including wallets, watches, notebooks (not computers) and planners, and travel accessories. The 30L Travel Bag is quite a sleek and modern looking bag with a rather premium look and feel. It has lots of little compartments and pockets for better organization of your items when you’re away for a few days or just using it to carry your gym gear. There is even a really cool magnetic water bottle holder that will come in very handy. You’ll find a hidden money pocket, a retractable key leash to keep your keys accessible and safe, RFID safe pockets to keep your electronic gear safe, cord pass throughs with holes for your cables to pass through the bag, a socks and undies section, a detachable shelf for glasses, a laptop/ tablet compartment, a notebook pocket, sternum strap, removable waist straps, reflective ink, and a roller bag sleeve to slip over the top of the suitcase telescoping handle. You can open the laptop/tablet compartment easily when you’re going through the airport security. You have the Nomatic Backpack with a 20 liter capacity that can be expanded to 24 liters and a larger 40 liter capacity travel bag that you may want to check out as well.